On that note we bid you goodnight. Ryan Crombleholme: Solid basis to build on for Moyes. Can assess players further and change around. A tight affair with limited quality going forward but Moyes will draw positives from the clean sheet and his side's endeavour throughout at a tricky venue. The point moves them up a place to 14th with Depor one position further back. 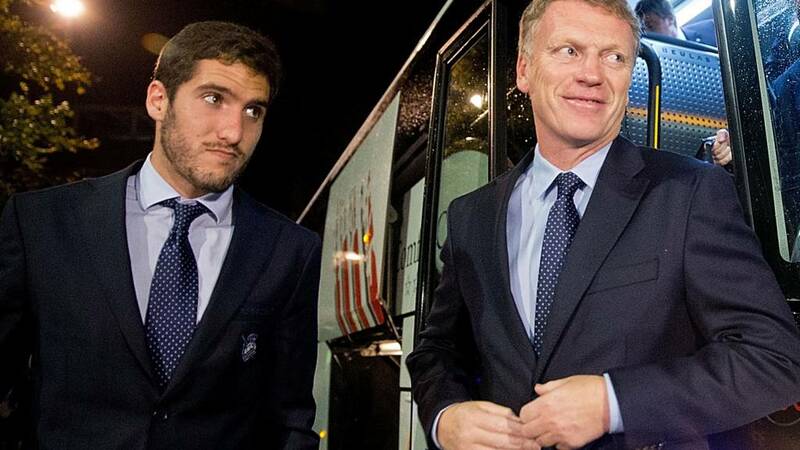 A first league clean sheet in seven months for Real Sociedad and David Moyes is unbeaten in Spain. Just three minutes of injury time to go. A winner looks unlikely, but if anyone has had a football adventure recently it is David Moyes, so who knows. The Scot stands alongside his translator and points energetically to players. Real Sociedad have not kept a league clean sheet this season and it is heart in mouth time. Their central defender Gorka Elustondo plays a poor back pass, leaving goalkeeper Enaut Zubikarai to tidy up hastily. The shining light for David Moyes tonight will surely be Carlos Vela. The former Arsenal player is bright and feisty in carving out his own chances. He powers around a challenge this time and while wrestling in the area, gets a shot off which goes wide. Vela, still only 25, scored 17 goals in all competitions last season. On his 50th appearance for Deportivo, Pablo Insua arrives unmarked to meet a corner kick but makes a hash of his header and the ball drops into the hands of the Real Sociedad's goalkeeper. From inside the six-yard box that was a chance. The home side are on top now though, corners aplenty. Will Moyes look to tighten it up? Oh David. You wore a suit, you looked the business and then this photo comes through. Trousers sporting a rip do not create the right first impression. That's just sloppy. received a reported £5.2m in compensation when he left Manchester United. The odd goal, a set piece or a moment of unforeseeable genius look like the only ways we will see a goal here. A point may not be a bad start to Spanish life for David Moyes. He lost captain Xabi Prieto and two of his back four to injury ahead of this match. Plus game two will undoubtedly bring fewer cameral lenses, more time to adapt and a home crowd against lowly Elche. Depor have introduced Cezary Wilk for Juan Dominguez in this half but a flurry of offsides ate hampering both teams. Pundit de Satge: Ronaldo has 197 goals since 2009?? Surely after 150 scored it should be a goals per game ratio? Ronaldo's would be unreal! Danny, Hemel: To compare Lionel Messi's league record to Ronaldo is ridiculous - he was in the league five years before Ronaldo and on average Ronaldo is banging in 35 a season so five times that is 175 - if they started in the league at the same time Ronaldo would be miles ahead - a fact! The camera lenses are zoned in on him and his side are back out for the second half. Can David Moyes start life at Deportivo with a win as he did at Preston, Everton and Manchester United? Miles, London: How many Spanish league goals has Ronaldo now scored? Anywhere near Messi? Everyone wants a picture with the history boy. takes to Instagram: "Congratulations tonight , to stay in football history !! An honour to be by your side." Juventus beat Lazio 3-0 tonight in Serie A to go three points clear over Roma again. All three goals came from ex-Manchester United players, with Paul Pogba's brace sandwiching a Carlos Tevez strike. Simone Padoin was sent off for the champions. How will David Moyes reflect on that first half of football in the Spanish game? Positively I would think. His side have twice gone close through Carlos Vela and late in the half, a whipped corner fizzes over the crossbar off the leg of a Deportivo defender. The whistle blows... over to you David. Remember, clenched fists, thumbs up and clapped hands will get the message over. Words are overrated. Those clubs David Moyes once called his own have all won today. Preston North End left Bristol City with three points. The Moyes factor hasn't helped any of them, can it nudge Real Sociedad up from 15th in La Liga by the end of the day. As this half has progressed, Moyes's level of satisfaction will have steadily increased. His side have created the better openings and Carlos Vela is at the heart of their latest foray. He curls an effort over the bar from 18 yards. His manager has settled again on the touchline. A low profile may be advised after seemingly riling a rival coach to the point where he was dismissed. Carlos Vela looks the most likely to break the deadlock here and he cuts in from the flank to curl an effort and force a smart tipped save. Uproar on the Deportivo bench as they claim offside and David Moyes is drawn into it. He flutters his hand, telling a member of Depor's coaching team to calm down. The instruction does the opposite and it seems Moyes is bringing some Scottish fire to proceedings. The game has been bland, a touchline riot would liven it up somewhat. Quddus Wahid: La Liga is not as pressuring as the PL and Sociedad are not as collossos as United. I don't see why Moyes should struggle. Real Sociedad defend a corner well and spring into a counter-attack through Sergio Canales. Carlos Vela is on hand to receive a pass but his touch is heavy. They had a three against one situation to play with there and they made a pig's ear of it. David Moyes has a translator sat by him in his rain-sodden dugout. The gentleman in question has the type of Spanish name you may expect... Derek. takes to Twitter: Great game and 3 very important points!!!! CONGRATULATIONS Leo, you keep on making history! Messi reached 253 La Liga goals with a hat-trick against Sevilla making him the league's highest ever scorer. Forget Lionel Messi's goal scoring record, when a goalkeeper saves a stinging shot with his face, let the praise rain down. Real Sociedad have grown into this and Sergio Canales drives through bodies in the area, forcing Agosto Fabricio to improvise. The ball finds his nose but he's the brave sort is Fabricio, no messing, up he gets. Good save son. Ryan Crombleholme: This Sociedad side is better than Moyes' Everton. Carlos Vela and Inigo Martinez stand out. First day at work, always wear a suit. And he has. Some may recall Moyes in a tracksuit, putting Everton through their warm-up drills before a game. He seems to have picked up the art of delegation. David Moyes says the Real Sociedad job "fits my character" and there is no doubt he cut a chipper figure when presented to the press. but just how bad was he at Old Trafford? Moyes brought an end to Champions League football at Manchester United for the first time since 1995. He guided United to only their second finish behind Liverpool since 1992, when the Premier League started. The former Everton boss oversaw the worst home record at Old Trafford since 1978. But none of that matters now. Moyes is in northern Spain, what could possibly go wrong? The Moyes factor aside, this game actually sees two sides in a fairly glum position going at it. Real Sociedad sit 15th and Depor are two positions worse off. The losers here could find themselves in the bottom three by Sunday night. Deportivo start the better in front of a home crowd at the Riazor but set-piece deliveries are well defended by the team from San Sebastian. Dave Rotherham, York: I wish all the best for David Moyes in Spain. He wasn't given enough time at Man Utd to show his capabilities. On the plus side, Man Utd and their fans have been dragged off their high horses into the chop and change philosophy of modern day club management. "The good news for Moyes - and surely one of the main reasons he has taken the job - is that his new squad contains plenty of talent, with their current position of 15th with nine points from 11 games an inaccurate reflection of the team's true capabilities. "Although the departure of star forward Antoine Griezmann has undeniably left a hole up front, Moyes can still call upon Carlos Vela who, despite struggling with Arsenal as a youngster, has been one of Spanish football's most consistent scorers in recent years. "Moyes's new midfield is stacked with potential, including two young players who have long been regarded as potential future Spanish internationals: former Real Madrid man Sergio Canales and youth team product Ruben Pardo." read more of Andy's views in a feature highlighting challenges Moyes will face. Yousuf Ahmed: At United Moyes' lack of football know-how was highlighted but for a mid-table side like Sociedad he will succeed. Will Carter: I think he'll succeed - similar ambitions, budget and squad make up to what he managed at Everton. United was just a step too far. And David Moyes's managerial career in Spain is underway. His side are playing in orange. Will the future be as bright? In his first games in charge of the three clubs he has managed before tonight, David Moyes has a flawless record. The Scot guided Preston to a 2-1 Division Two victory over Luton Town in his first game in 1998, Everton to a win by the same scoreline over Fulham in 2002 and Manchester United to a 4-1 thumping of Swansea last season. Can he motivate his new troops in a foreign language? Here you go David: 'Vamos Muchachos' apparently means 'come on lads'. Can Moyes succeed in Spain? James Hoult: Wasn't given a fair chance at United but did a good job at Everton with a limited budget. Got them fourth once and in most seasons got them in Europa League, also got to an FA Cup final against Chelsea in 2009. But he always had teams ahead of his team ie United, Arsenal, Chelsea, Liverpool, Spurs, even Portsmouth won the FA Cup in his time at Everton. Now if we're honest it's going to be the same in Spain because his team will have to compete with Real Madrid, Atletico Madrid, Barcelona, Valencia, Sevilla, Villarreal etc which just like in his Premier League days won't be easy but even as a Liverpool fan I wish Moyes all the best in Spain. Have your say over on Facebook. Sevilla have not beaten Barcelona in the league since 2007. Still, at least they can say they were part of history. Now, David Moyes... follow that. Telmo Zara hit his 251 goals in 15 years at Athletic Bilbao between 1940 and 1955. He notched 20 in 20 caps for Spain and died of a heart attack at the age of 85 in 2006. Records are there to be broken but this one will now take some passing. Sevilla's brief parity early in the second-half through Jordi Alba's own goal was a golden opportunity for Unai Emery's side. They have still not had a shot of their own at goal and that was a gift-wrapped chance for them to dig in. They did the opposite, Lionel Messi punished them and as Neymar fires a volley down the throat of Beto, it could get worse. We could write a live text just about this guy. He deserves to win Strictly Come Dancing, Master Chef and University Challenge for this display. Lionel Messi dances through challenges and runs from the right touchline to a central position, plays a wall pass with Neymar and drives home from 18 yards. Clinical. A full 253 La Liga goals not out. So Lionel Messi has hit 252 league goals in, wait for it, 250 starts for Barcelona. All right, the pedants among you may point to 38 substitute appearances, but I think it is safe to say that is not too bad. buying the wee man's family a flat to seal his signing at the age of 15 would have been a good bit of business? Spanish football expert Guillem Balague believes reluctance to throw a flat into the offer was a deal breaker when the Gunners tried bringing Messi to the club along with Cesc Fabregas. "It was not completely down to a flat in the end. It was down to the fact that Messi was comfortable at Barcelona," Arsenal boss Arsene Wenger said on Friday. But Arsene, if you had tempted him with a balcony and stretched to heated wooden flooring, just think of the possibilities. And there it is. The La Liga record all on his own. His first goal showed his quality, the second was all about hunger. Lionel Messi picks the ball up just inside the Sevilla half and with a three against two situation in Barca's favour, the alarm bells are ringing. The Argentine drives at the defence and feeds Neymar who passes across goal... Luis Suarez will turn it in but Messi wants this, he finds a yard, slides and nudges the ball home. A unique goalscorer with desire aplenty. No player has ever scored as many La Liga goals. Barcelona, their own goal aside, have shown glimpses tonight of the side which won so many plaudits under Pep Guardiola. It is far from vintage, but snippets of that free-flowing attacking zest are evident. Luis Suarez receives a ball from Jordi Alba 35 yards out and as the left back gallops for a return pass, Suarez's flick is exquisite. It finds its target and Alba volleys wide from 12 yards. Slick, clever, dangerous. Suarez deserves a goal. Perennial champions Juventus are beating Lazio 1-0 in Rome. Paul Pogba opened the scoring with a finish from Carlos Tevez's ball and the midfielder has just hit the woodwork with an effort from the edge of the box. Ivan Rakitic puts his head in his hands as he powers a header home against his old club. No celebration here. The Croatia midfielder profits from unselfish Luis Suarez running and connects with a perfectly floated delivery to nod in. Beto in the Sevilla goal gets a hand to it but this one is way over the line. Points sealed? Gerard Deulofeu, 20, is still a Barcelona player but has just two appearances for his parent club. His latest loan move to Sevilla follows a season at Everton. And perhaps Luis Enrique's decision to farm the youngster out is to stop the kind of decision making we have just seen. Deulofeu has a chance to cross with Carlos Bacca in space in the areabut elects to cut-back onto his left foot. A waste. A double round of applause at the Nou Camp as Denis Suarez - a former Barcelona player - leaves the field for Sevilla and coming on is a name many of you may recognise... Gerard Deulofeu. Henry from Manchester: Messi has 251 goals in 289 La Liga games which is amazing, but not unique. Ferenc Puskas has similar stats, and if Raul was playing now he would score loads more. Sevilla will kick themselves for their charity in gifting Barcelona the lead and the experience shown by their hosts offers complete contrast. Barcelona follow up their strike with a period of solid play, neat possession in and around the 18-yard-box and a shot from range by Ivan Rakitic. They are taking the sting out of this one whilst looking threatening. Your side equalise in the Nou Camp, so surely you use your head for five minutes, take the sting out of it? A foul just inside the Sevilla half allows Xavi to whip in a delivery and at sixes and sevens, Sevilla's defence is breached. It's Neymar, it's a glancing header and it's his 11th league goal of the season. The locals are still gorging on chorizo in the snack bars... this one was one-way traffic before the break so what is the need to rush back? Vitolo gets down the Barca left with some trickery and his cross is met at the near post by Barcelona left-back Jordi Alba. It bobbles over the line through a mixture of knee, shin and other generally ugly parts of the body which often lead to not so nice things happening in the six yard box. Elsewhere tonight, Roma are temporarily level at the top of Italy's Serie A after a 2-1 win away at Atalanta, while their city neighbours Lazio are currently goalless against Juventus - who will move a point clear if the score stays as is. Alex: Will Moyes succeed or fail? I don't know what success means for Sociedad, but I can't see them finishing higher than seventh. Extraordinary. Freakish. How would you sum up what Messi has achieved by the age of 27? To put it into some context, Real Madrid legend Raul only reached 228 goals in 550 games. Cristiano Ronaldo has a haul of 197 in 176 appearances. Barcelona may only be two places above their visitors but the gulf here has been vast. Luis Enrique's side have monopolised possession and Sevilla are yet to register a shot on goal. The intricacies are meaningless however as Lionel Messi is the story. He now shares La Liga's all-time scoring record - though that may change in the second half. A dominant Barca display has yielded few chances, but two arrive at one as the first-half draws to a close. Jordi Alba - who has ran Sevilla hard down the Barca left - gets in behind and his shot beats the keeper but finds a sliding defender on the goal-line. From the corner, do Barca put it in the mixer? Never. They work an opening for Neymar who has a golden chance from 12 yards saved by Beto's legs. Big chance, Sevilla like a boxer on the ropes. Moments after Coke is booked for his brutality on Neymar, Lionel Messi is chopped down having clearly got the the ball quicker than Sevilla's Daniel Carrico - no foul. Then Barcelona's Ivan Rakitic - playing against his old club - is wrestled down and when nothing is given, the locals make their feelings known. Barca players surround the referee. You get the feeling Sevilla will need to be industrial if they are to keep tabs on their hosts tonight. Sevilla defender Coke puts in what we will call a 'robust' challenge on Neymar. It involves shirt pulling and a bit of a boot from behind. No prisoners then. Bad news for Coke though, out comes the yellow card and he now misses his side's next match against Granada. Will Moyes succeed in Spain? John McEnerney: Moyes is now in the most fickle league in the world, he'll need a miracle to keep his job & he doesn't do miracles - we know that. Luis Enrique cuts a dapper figure on the Barca touchline. Hands in his pockets, he sports a three-piece suit tonight along with some designer stubble. His side are well on top here, dictating, being typically positive with the ball. Caz Diamond: As a Manchester United fan, I feel sorry for David Moyes as he is a good manager. And I know that his time at Real Sociedad won't become the sad story it did at United. All the best Moyes. Harrison James Fletcher: I have a lot of respect for the guy and for what he did for Everton. But when he faces the likes of Barcelona, Real Madrid and Atletico Madrid, that's where he will drop points, I think. But by all means, good luck to him - he's going to need it in La Liga. So will Sevilla be swept away by a tide of Lionel Messi love pouring from the stands at the Nou Camp? It would appear not as they respond with their best passage of a play but a corner, forcefully headed away by Gerard Pique, is as much as they get for the effort. 'Felicitatas Messi' reads the Nou Camp scoreboard. He has levelled Telmo Zarra's all-time La Liga goal scoring record, though the former Athletic Bilbao striker did in in 12 games fewer. If there is ever a way to equal the La Liga scoring record this is it. The stage set, free-kick, 18 yards and central, Lionel Messi steps up left footed and whips the ball into the top corner. You could put three goalkeepers in there and it would still go in. Beto is helpless, Messi's name reverberates around the Nou Camp. He has 251 La Liga goals. It would appear Sevilla midfielder Grzegorz Krychowiak is going to hug, cuddle, wrestle and do whatever he needs to in order to stop Lionel Messi tonight. He almost hitches a ride on Messi's back in attempting to stop the Argentine. Jordi Alba again gets in behind the visiting defence down Barca's left side but his delivery evades the onrushing masses and though it is one way traffic, it remains level. Would you want your side going to Barcelona after an international break? The home crowd whoop and roar as a neat exchange releases Jordi Alba, his cut-back finds Luis Suarez who feeds Neymar instantly but the shot is blocked. That was football at speed and Barca have the look of a side itching for a game. Lionel Messi, 18 yards, central, space... his curled effort draws breath around the Nou Camp but Portuguese goalkeeper Beto dives to his right and clasps the yellow ball. No record yet and Sevilla are let off the hook. Offering this guy his own postcode of space is not clever. Mark Baker: Of course he can. He hasn't become a bad manager because of less than a season at Man United. Especially when you look at how bad Van Gaal has done in comparison. Sociedad are vastly underperforming, and he definitely has the quality and backing to change that. Ryan Lee Livingstone: Good manager, never had a chance, career ruined. Chris Casey: He won't do anything special. Mark Watson: He will be sacked by the summer. The early pattern starts as you would expect at the Nou Camp. Barcelona's full-backs playing high up the field, Sevilla in a disciplined eight-man block with two lines of four in defence and midfield. Luis Suarez has had some early touches, much to the joy of home supporters who roar when the Uruguayan puts the ball under his spell. Barcelona are one of only two teams (with Recreativo) that Unai Emery has faced as a La Liga manager and never beaten. He has four draws to his name, but not a single win over the Catalans. And here we go, Barcelona get the ball rolling at the Nou Camp, Luis Suarez, Lionel Messi and Neymar leading the line. Looks like a 0-0 draw then. Sevilla do not like this ground. They have not left with three points for 12 years. Atletico Madrid are an incessant force. Champions last year, some experts believed the power would return to Spain's traditional big two this season. But victory over Malaga - with goals from Diego Godin, Tiago and Antoine Griezmann - puts them second, four points behind Real Madrid. All over at Ipurua Municipal Stadium at Real Madrid complete a 4-0 win. Cristiano Ronaldo proves he can ever score scuffed efforts as his first is struck into the ground, bouncing high into the net. If he was that good he would catch it clean. He fired a penalty in late on to seal another win for Carlo Ancelotti's side who now have 101 league goals in 2014 - the most in Europe. And the future of David Moyes in Spain provides our debate tonight, simply tweet #bbceurofooty or text 81111 (UK only) and tell us if you think Moyes will succeed or fail at Real Sociedad. In taking charge of Real Sociedad after they parted with Jagoba Arrasate, David Moyes becomes the fourth British man to take the helm at the Basque club. He follows Harry Lowe (1930-35), John Toshack - who had three spells in charge - and Chris Coleman who lasted just under six months in 2007. Only Toshack landed silverware, winning the Copa del Rey in 1987. Lionel Messi will be once again under the spotlight when Barcelona entertain Sevilla. The 27-year-old has unthinkably not scored in three league games and needs just two more goals to beat Telmo Zarra's all-time league record of 251. Spanish paper Mundo Deportivo is expecting big things, leading with the hash tag 'always messi' today. Barcelona will remain second at best if they beat Sevilla as rivals Real Madrid have made routine work of their trip to Eibar. Some fella called Cristiano Ronaldo has scored two - he sounds decent - while goals from Karim Benzema and James Rodriguez see Los Blancos 4-0 up with around five minutes remaining. Ronaldo now has 20 goals in 11 league games and Madrid will hold a four-point lead at the top over Atletico - winners earlier - with Barca one point further back. Barcelona: Bravo, Dani Alves, Pique, Mathieu, Alba, Xavi, Busquets, Rakitic, Suarez, Messi, Neymar. Sevilla: Beto, Andujar Moreno, Martin Pareja, Carrico Martins, Figueiras, Banega, Krychowiak, Vidal Parreu, Suarez, Machin Perez, Bacca. Barcelona need a victory tonight to ignite their form ahead of a tricky run of games. Luis Garcia's side lost two matches on the spin before winning last time out against Almeria and now sit second, trailing Real Madrid by two points. After tonight's visit of fifth-placed Sevilla, they face a tricky trip to Valencia and then a local derby with Espanyol. "best league in the world". "La Liga has the finest players and great coaches and I want to test myself against the best," the 51-year-old told reporters in his first news conference. Real Sociedad away at Deportivo may not throw up Brazil '70 levels of football, but we will have every blow from Sevilla v Barcelona here for you before Moyes' debut - that one could be sparkly. What is that saying? You can't keep a good man down? 700 miles south at Real Sociedad. How will he handle his first game in charge? That awkward managerial smile as the cameras swamp the dugout will undoubtedly be called for come 21:00 GMT tonight.